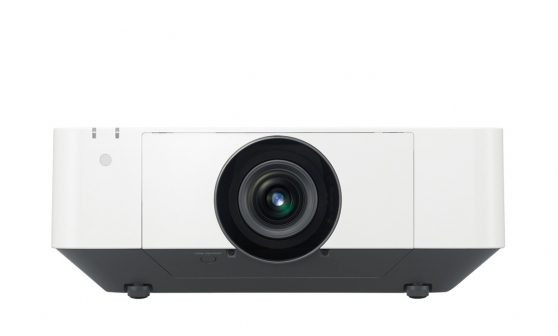 The VPL-FWZ65 laser projector is ideal for a wide range of business, education and general presentation applications. The powerful Z-Phosphor laser light source is teamed with Sony's advanced BrightEra 3LCD projection engine to deliver extremely bright, crisp WXGA resolution images with powerful 6,000 lumens maximum light output and rich, stable colours. Constant Brightness maintains the same brightness throughout the 20,000 hours recommended life span. The laser light source allows up to 20,000 hours* of virtually zero maintenance operation without the worry of sudden lamp failures. An automated filter system cuts the hassle of regular dust cleaning. Near-zero maintenance needs are complemented by a range of energy-saving feature, significantly driving down total lifetime ownership costs. Offering a stylish blend-in design, tidy cable management and low fan noise, the VPL-FWZ65 fits smoothly into almost any environment – from academic institutions, corporate, medical training and public sector organisations to visitor attractions and retail spaces. Seamlessly blend images from multiple projectors to create super-sized displays, or project accurately proportioned images onto angled or curved surfaces. Mount the projector at any angle, even on its side or upside down. Set-up's easy with a friendly installation menu. The Z-Phosphor laser light source is coupled with Sony's acclaimed BrightEra 3LCD projection engine to ensure high 6,000 lumen image brightness (in High mode) with vivid, natural colour reproduction. Constant Brightness maintains the same brightness throughout the 20,000 hours recommended lifespan. Installation flexibility is increased by a wide range of compatible lens options to suit virtually any size of room and throw requirements. Quick-release bayonet mount simpifies quick lens exchange. The stylish case design features a flat top surface that blends in discreetly when the projector is ceiling mounted. The clean appearance is accentuated by a terminal cover that reduces cable clutter. Picture Mode ensures great-looking pictures in any presentation conditions. Select Standard, Dynamic, Brightness Priority or Multi Screen mode for optimised image quality, with any source and in every room. Laser projection cuts running costs in Euskalduna Conference Centre. Discover our leading range of Laser Light Source projectors.